Tired of reaching for the same boring lunch every day? Sick of shelling out £3 on a lacklustre Tesco meal deal? Finding alternative lunchbox fillers for uni, school, or work can be difficult, especially when you're trying to eat healthily, so today I've collated an extensive range of products in the hope that you'll see something to tickle your fancy! Time is of the essence at lunchtime for all of us, so everything that I've picked out will be ready in a flash as well! There isn't a bag of crisps or a chocolate bar in sight but don't worry - these items are totally delicious and won't hurt your waistline either. Let's get started! The first products that I have to share with you today come from the lovely people at Mr Lee's Noodles. Now I KNOW what you're thinking - instant noodles? That's not a healthy option, Abbey. But hold up there for a second, as you might just be pleasantly surprised. 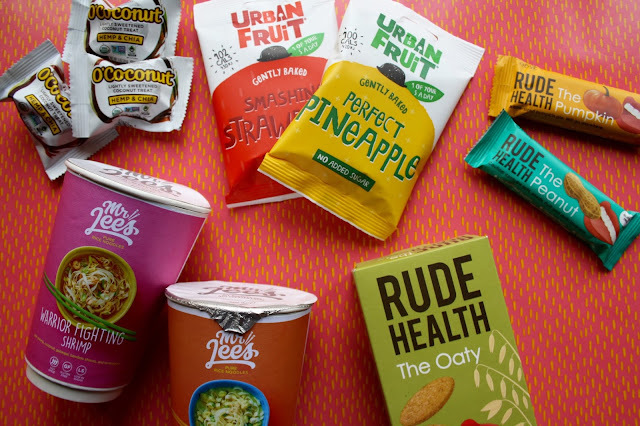 Damien Lee, founder of Mr Lee's Noodles, created these products after recovering from stage 4 cancer, after pledging to lead a healthier lifestyle. 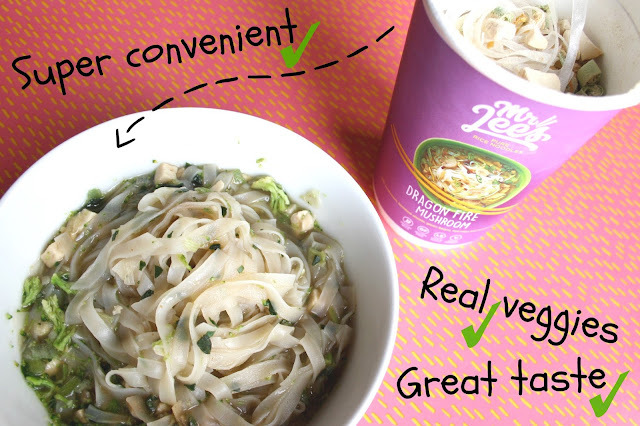 The noodles are low in sugar, and free from gluten, MSG, hydrogenated fat, and E-numbers. The alongside the freeze-dried noodles, the cups contain (wait for it) ACTUAL vegetables, which look and taste like the real deal. These are easily the best quality instant noodles that I've ever tried, and they're delicious too! My favourite flavour was definitely the Shaolin Monk Vegetable - seasoned to perfection! I was lucky enough to recieve a selection of Mr Lee's brand new flavours, as yet unreleased, to share with you! Make sure you look out for the funky new packaging in the supermarket! 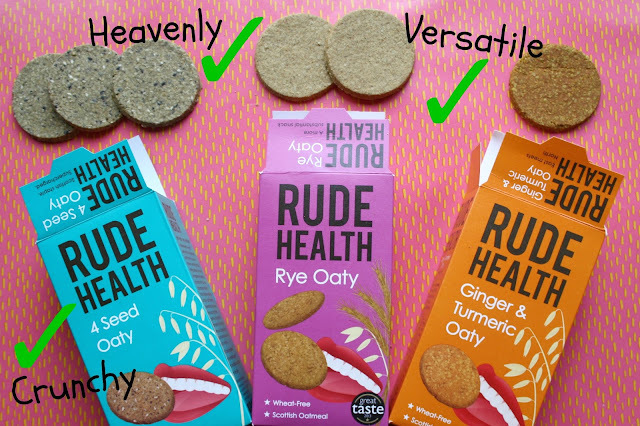 Further savoury options to tempt your tastebuds are these delicious Oaties from Rude Health. Rude Health describe these as being like the little black dress - fantastic no matter where you are! And I can't help but agree, there are so many different ways to enjoy these snacks! I personally really enjoy pairing these with a little cheese and (if I'm feeling adventurous) some chutney or relish, they go down a treat for lunch! However, these can equally be enjoyed as a snack by themselves - I find them incredibly filling and satisfying! You can go for the original Oaty, or choose from a variety of flavours, from 4 Seed to Ginger & Tumeric. 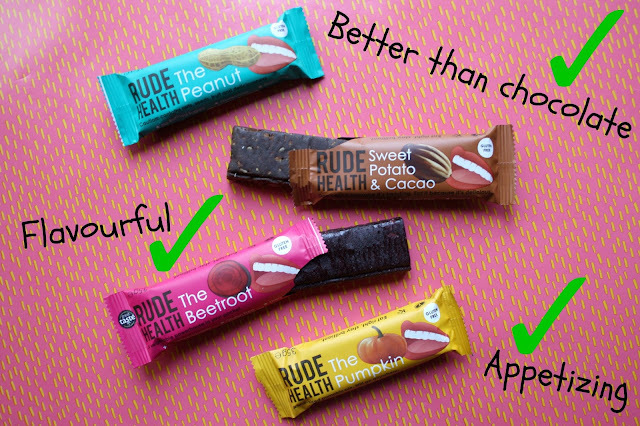 Rude Health were incredibly generous with their sample package and included not only a selection of their Oaties for me to try, but some of their snack bars too! Truth be told, I wasn't sure what to expect from a Beetroot snack bar, but I was incredibly impressed! All of the bars had a delicious chewy, fudge-like texture which I really enjoyed. They are not only gluten free, but also wheat and dairy free, and contain no refined sugars! As an alternative to a chocolate bar, these are absolute winners! My favourite from the selection was probably the Sweet Potato and Cacao, which I'll certainly be repurchasing! Next up, we have these delicious treats from Urban Fruit! These 100% natural, vegan friendly fruit snacks are the perfect addition to any lunchbox. The packs of gently baked dried fruit come in at just 100 calories each, and there are no added sugars or nasty preservatives. They even count as one of your essential five a day! I really enjoyed sampling these, in particular the Smashing Strawberries - I felt like I was eating sweets instead of a healthy snack! 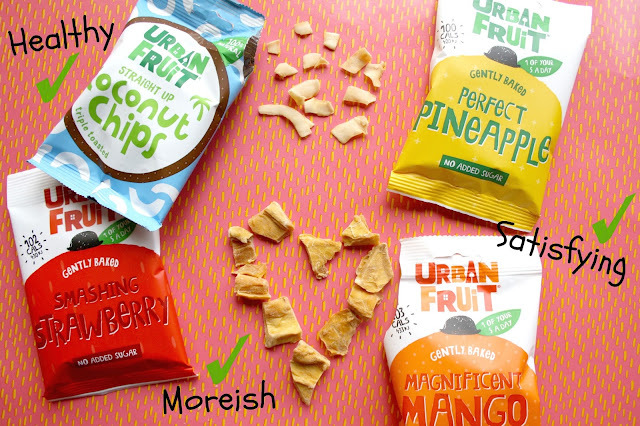 The toasted coconut chips were another hit with me, they have a truly scrummy texture and satisfy your desire for a CRUNCH, for which you'd usually turn to an unhealthy packet of crisps! These are equally great if you're shopping for lunchbox fillers for yourself, or for children. If you experience a mid-afternoon lull in motivation and concentration, as I often do, you may like to turn to these little guys for that all-important pick me up! 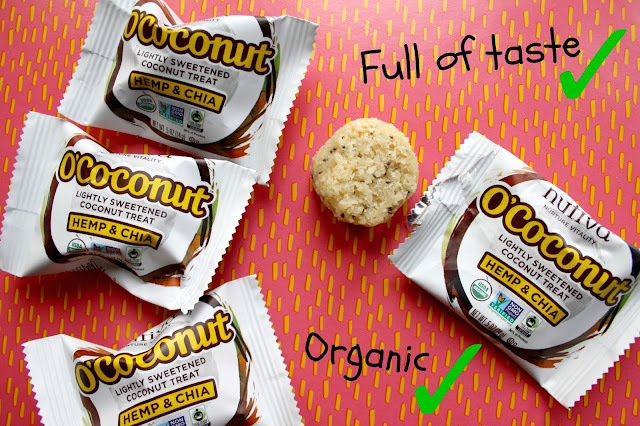 Nutiva O'Coconut Hemp and Chia snacks have a pure coconut taste with the ideal amount of bite! All of the flavours are balanced perfectly. At only 60 calories each, these organic balls of joy are excellent snacks to nibble on, without ruining your diet. These have become a lunchbox staple for me, and I highly recommend them! 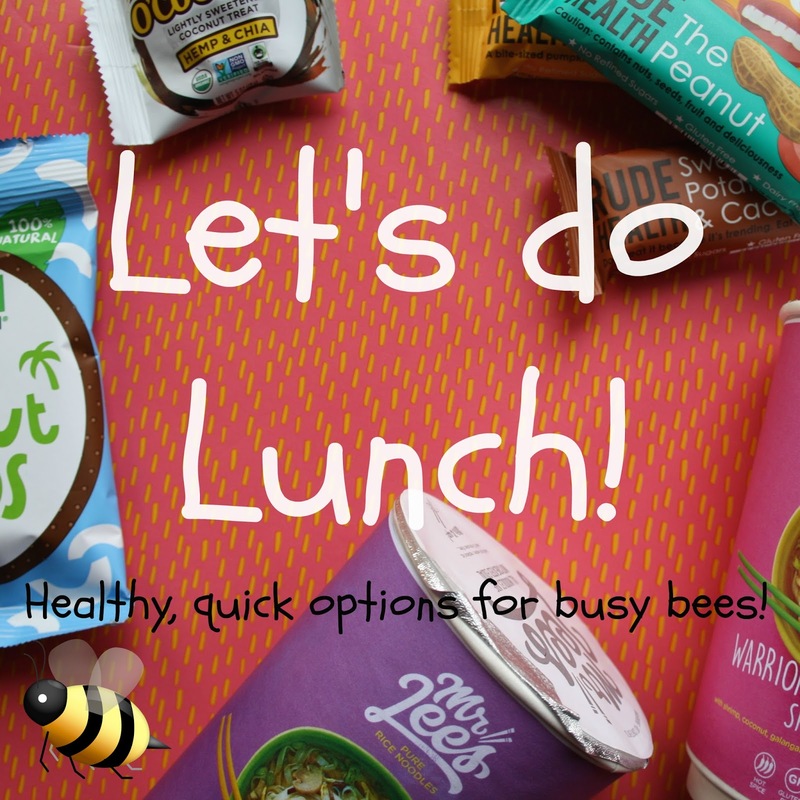 And there you have it - my quick and healthy lunchbox fillers to suit any taste! I honestly really enjoyed sampling each and every one of these products, so I encourage you to try them out too! What are your healthy lunch essentials? Would you like to try any of the brands I've recommended? Leave a comment below and let me know! *Disclaimer: The products featured were provided by their respective companies for review. All opinions are my own.